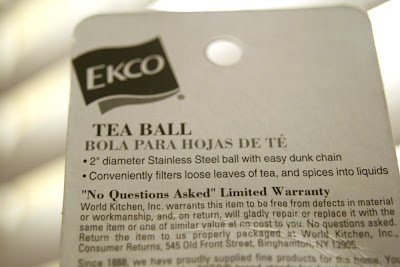 The “Blog” of “Unnecessary” Quotation Marks: "no questions asked"
Paul bought this tea ball for $3 (that is one of those things that holds and steeps loose tea). Evidently if you return the item, they may ask you a FEW questions. Perhaps like "can I help you?" or perhaps "how old they are?"